Follow these 7 simple steps and you’ll get your Nicereply account up and running in no time. If you'd like to get a full tour of Nicereply and all it's features you can schedule a 5-minute Skype call with our support team. 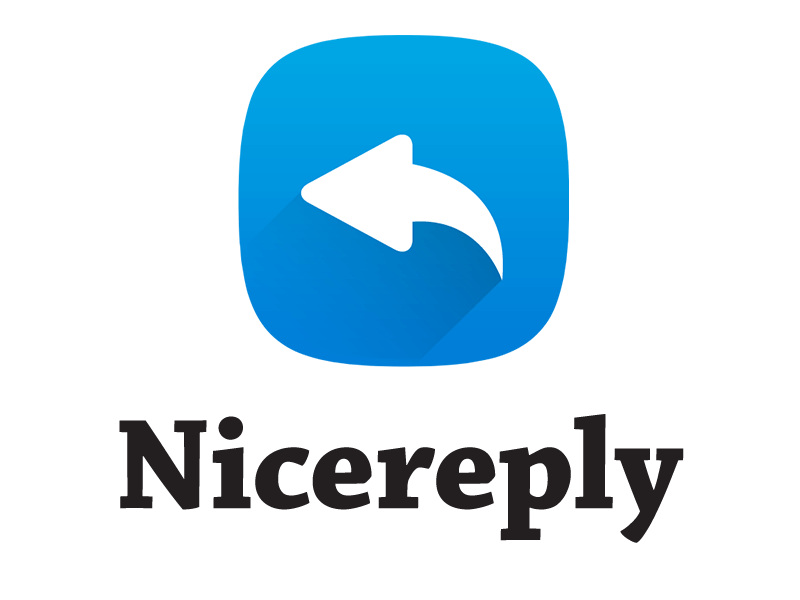 Our representative will personally walk you through Nicereply integration and all its features. Choose the customer satisfaction metric in the left menu. 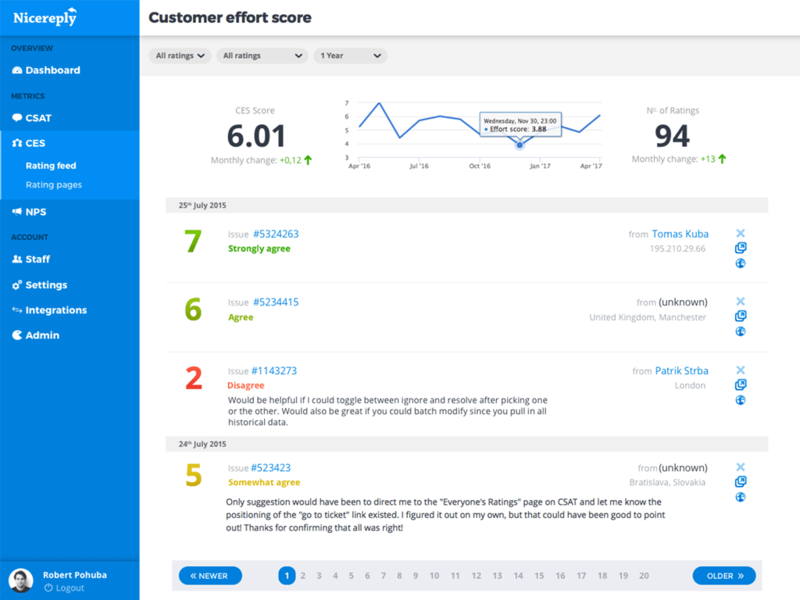 You can use Nicereply to track CSAT (Customer Satisfaction Score), NPS (Net Promoter Score) and CES (Customer Effort Score). One you've chosen customer satisfaction metric you need to decide how to distribute the survey to you customers. Each distribution method has specific features and benefits. You can add more distributions at any time. You decide to whom and when you wish to send NPS form. Easiest way to contact any audience via simple email import. 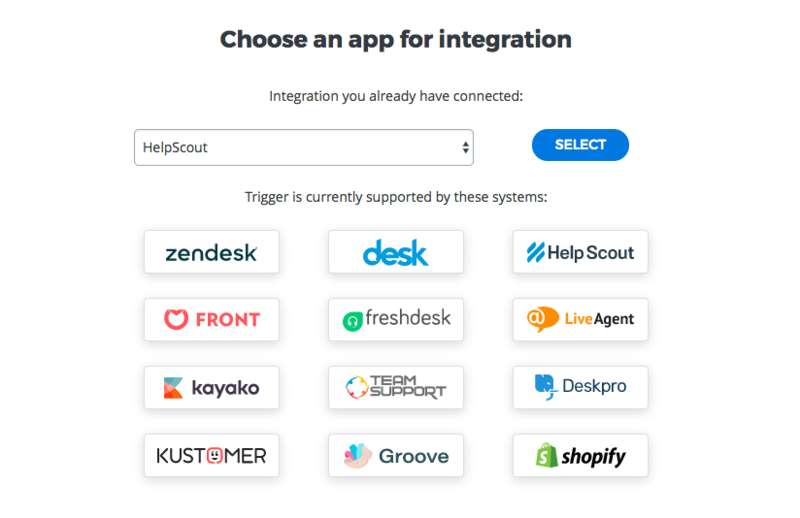 In the next step you need to choose the customer service software from our integrations list. Once you decided which service you're planning to use simply follow the integration steps for that specific software. All you need to do is insert your software credentials, and then insert the survey code to your email template or active the trigger. After that you'll be ready to start collecting feedback. You can find all the integration manuals HERE. 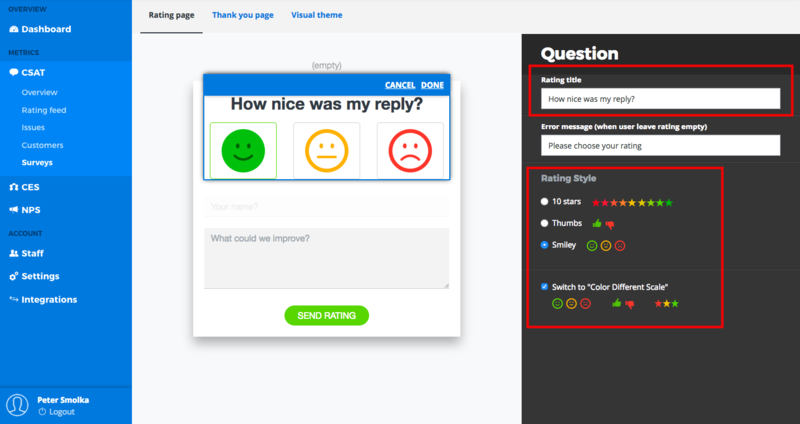 In Nicereply you can customize your CSAT/CES/NPS surveys according to your branding and needs. Ask your customers the right question at the right time with branded one-click surveys. Simply go to customer satisfaction metric you're using > click surveys > and then click on appearance of the survey you want to customize. Here you can edit rating page, thank you page and also visual theme of the survey. You can add extra question, upload company logo, edit rating title, change rating style, or switch to color different scale. You can also choose from different visual themes, or create your own. 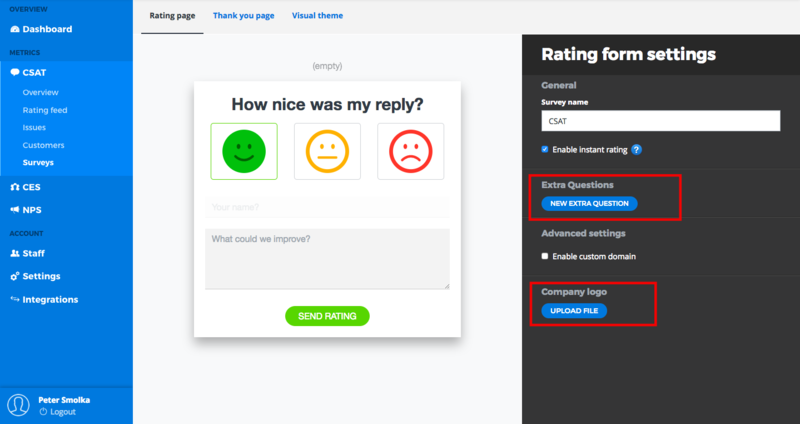 With Nicereply you can also customize the language of your rating survey. You can find the information about this process here. You can also customize your surveys with our API. If you decided to distribute your surveys via trigger you can manage the trigger behaviour in trigger settings. Go to your selected customer satisfaction metric > click surveys > and click trigger settings of your survey. Here you can for example edit sender name or edit the number of days after which the survey can be send to the same customer. 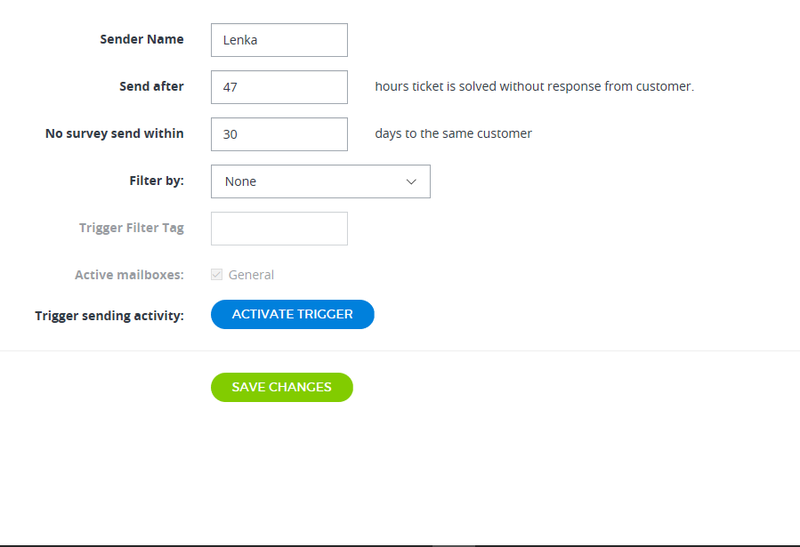 After you active the trigger Nicereply will start scanning the status of your tickets on a regular basis. Then, Nicereply will send the CSAT/CES/NPS survey to the ticket requestor for all tickets created via Email channel, with status Resolved and without ticket update for 48 hours (by default). You can also change the number of hours after which the survey is send to the customer. When you're done don't forget to save your changes. When setting up your Nicereply integration you can sync all your users from your customer service software with one click. New users will get an automated email with login instructions. You can manage your users under the staff tab. 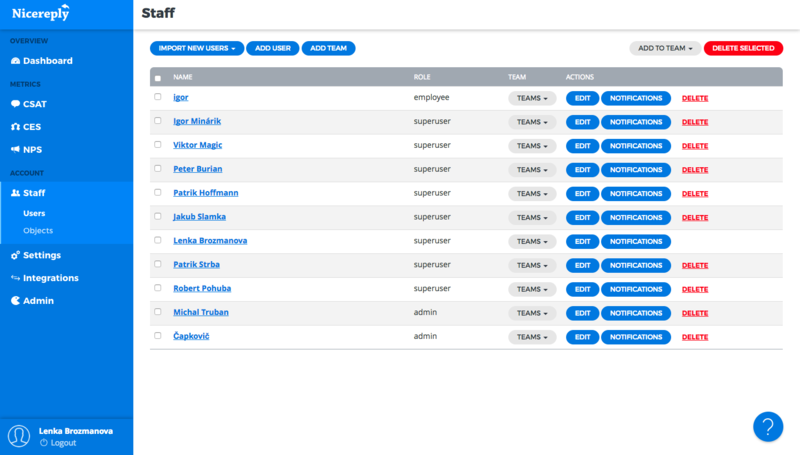 Here you can add new users, add new user teams, delete users, or import users from your customer service software, or via CSV file. With Nicereply you can analyze your ratings with Dashboards. Simply go to the customer satisfaction metric you're using, and click rating feed. Here you can for example see your total number of ratings, average score, development of your score through chosen period of time. You can also see specific ratings with agent name or issue number, customer name, comment, and direct link to the rated ticket. Your ratings will be pushed to your chosen customer service and will be stored in your Nicereply account. Thanks to ticket backlink you'll be able to identify feedback in context with the direct link to the rated ticket. Nicereply will automatically add customer names in the rating feed based on the ticket ID, so you don't need to use the name field on the survey.